Designed in the harsh Alaskan Arctic, the BootGlove provides a protecting layer of insulating neoprene for your ski boots to reduce wind chill and prevent loss of body heat in extreme winter conditions. Overall, the BootGlove retains an average of +20�F/7�C in your boot's toe box, conserving heat loss where it's most important...YOUR FEET! Do you work outdoors? Do you play hard in the snow and rain? Have you ever faced the daunting prospect of sticking warm feet into damp footwear that's been sitting out all night getting cold? In 1994, DryGuy emerged with its trademark "Forced Air" dryers to solve the problem of cold feet and hands that are caused by uncomfortably wet boots and gloves. Today DryGuy is a leading supplier of footwear and accessory dryers and thermal layering systems. Our products are designed to keep you at an optimum level of "comfort inside & out." In Seattle we get used to rainy days, but that doesn't mean we put up with wet feet. DryGuy boot dryers and insulation products were developed in Seattle with one goal in mind: keeping feet and hands warm and healthy. We've tested our products in some of the wettest conditions imaginable, and as a result we've come to understand a few things about how the wet and the cold can affect your recreation and your health. Wet feet are not just a result of wet weather. People of all ages and activity levels perspire or sweat, especially from the hands and feet. Between them, hands and feet collectively produce up to 16 ounces of sweat per day. That means that even people living in dry climates have to worry about wet shoes. While wet shoes might seem like little more than an inconvenience, they affect more than just your comfort. If your shoes don't get a chance to dry, you're likely to encounter some unwelcome house guests. Cold hands and feet are a common problem. When your body senses a loss of heat it compensates by slowing circulation to the extremities. This problem is compounded in wet conditions since dry footwear and gloves are 25 times warmer than moist garments. Fungus - takes root in wet shoes or gloves. Fungus can damage a perfectly good foot or finger. Athlete's foot can develop into a chronic problem requiring expensive treatment. Bacteria - grows in warm, moist environments and causes infections. More than 60,000 diabetics per year lose their toes to infections, and it's estimated that 75% of these amputations could be avoided with proper foot care. Odor - accompanies sweat, fungus and bacteria. Easy way to warm feet! The DryGuy BootGloves are MUST for any skiers who love to ski no matter how cold it gets. The neoprene covers are easy to put on and use with any ski binding. If the temperatures are super cold, simply put a toewarmer on the outside of your boot toe, beneath the BootGloves for extra warmth! ProsEasy to use They work! 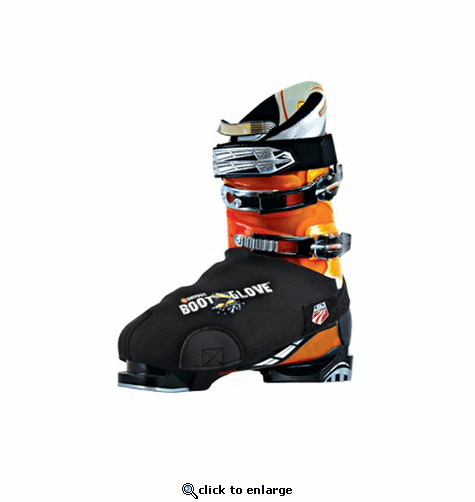 ConsBlack color mixes in easy with other ski gear, making them easy to lose in a boot bag, etc. This is a fantastic product to keep your feet warm on the slopes, you just have to be sure to keep the front of the glove clear of the toe binding. To that end I think the opening at the front should be just a wee bit bigger. Also, the under boot strap should be a stronger material and positioned a little farther back so it would rest right behind the toe plate of the boot. This would eliminate both the possibility of it interfering with the toe binding slide plate and greatly reduce wear and tear of this strap. Awesome and they really work. tested this product on a cold night and they really make a difference. A nice way to keep wind and snow out of the boot on those deep snow and windy days. Works even better than expected. ProsNot much money, easy to install, looks nice too.